This is a lovely body lotion with a very distinctive sweet aroma like a raspberry sherbet. The lotion has a medium consistency like a thick milk but more liquid than a cream. It is easy to massage into my skin and it disappears quickly enough allowing me to get dressed without fear of residue getting on my clothes. The main active ingredients are Aloe Vera, extracts of Wheat Straw, Cocoa Butter, Sunflower Seed Oil, Sesame Seed Oil and Sweet Almond Oil, among others. I always investigate the composition before using any skin care, but BioSphère have done all the work for me: on their website each ingredient is listed with a clear description of what it is and what it does. Really exceptional disclosure and very helpful if you care about such things. These products are also free of harmful chemicals, parabens, phthalates and sulfates and not tested on animals. The stylish dark purple bottle has a pump dispenser that works well and locks by twisting, to stop any post-usage drips. The contents (200 ml) should last well. I have been slathering this lotion on legs and arms daily for the last five weeks and there is lots still left. This luscious body lotion has not caused any irritation or adverse reaction (not surprising as all the ingredients are natural and more than half are organically-grown in France, where they take these things seriously). It works well as a hand cream at the end of the day and has made a positive difference to my legs especially, where the skin can get very dry in the summer with exposure to sun and salty water. Available on Amazon UK. An instant favourite with me, and my husband! I always try to involve him in my skin care testing because I think the male viewpoint is important. Men are increasingly using creams and lotions to improve their skin, which is great. However, a black bottle and sombre writing is not necessary to make a product suitable for male use. This cream is a case in point. Although the top note rose perfume is irresistible, the botanical mix seems to adapt to the chemistry of men so that there is never a powdery, overly sweet smell. In fact, even the stylish dark purple bottle does not look out of place in a man's bathroom. The pump dispenser works smoothly and I find that one prolonged pump is all I need to cover my whole face and neck. The cream has a dense, rich consistency, but it melts quickly into my skin and leaves no visible residue. I love the fact that it allows me a few minutes to massage it before being absorbed. The quantity (50 ml) is standard for a night cream; our test period started 4 weeks ago with two of us using it once a day (before bedtime) and we still have lots left. The natural ingredients are familiar to me, they are among the best botanicals with known beneficial effects for skin. I always investigate the composition before using any skin care, but BioSphère have done all the work for me: on their website each ingredient is listed with a description of what it is and what it does. Truly exceptional disclosure and very helpful if you care about such things. These products are also free of harmful chemicals, parabens, phthalates and sulfates and not tested on animals. 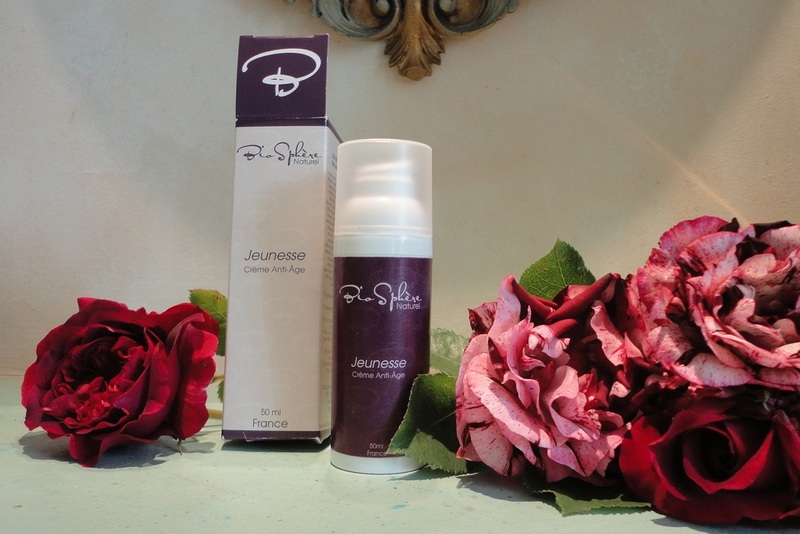 This luscious cream is one of the best night creams I have tried in years. It is gentle on my sensitive skin and has made a visible difference in the levels of hydration, something I can see as soon as I put it on. An exceptional product which I plan to buy again once my review bottle is finished. Available from Amazon UK. This is a deceptively light day cream which my skin really likes. I had already tried another product containing Water Lily extract and was familiar with its mildly astringent action, and here it is very effectively balanced by the other active ingredients (Sunflower Seed Oil to hydrate, Bamboo Stem Extract to detox and Rice Powder to reduce shine). If you want to know more about the ingredients, BioSphère have a full list on their website with a description of each ingredient and its action. This combination seems perfect for my mixed skin and it makes a good base for foundation and makeup. I find that it keeps my face hydrated all day without making it oily-looking. The plastic container holds 50 ml and has a smooth pump dispenser. A single pump is all that's needed for my face and neck. The consistency is like a thick lotion, a little less dense than the night cream. 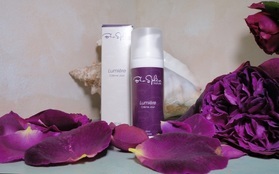 After a short massage it is absorbed fully and makes my skin visibly softer. I love the very fresh, unfussy fragrance. My husband is using it, too and is equally pleased with it. With two of us using it once daily, it's lasting well and there is still lots left after a 3-week test period. This cream is made in France where essential oils and natural botanical extracts are widely used and preferred to the synthetic formulas of some well-known brands. BioSphère products are free of harmful chemicals, parabens, phthalates and sulfates and not tested on animals. I am really enthusiastic about this gorgeous day cream, it suits my mature skin perfectly and has not caused any breakouts or allergies. An excellent product which I am happy to add to my daily routine. Available from Amazon UK.